Susan Seddon Boulet was a well-known visionary artist. She was born in Brazil in 1941, growing up on a citrus farm surrounded by the natural world. Eventually she settled in Oakland, CA where she lived until her death in 1997. 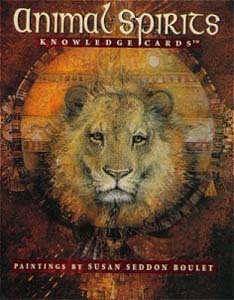 The Animal Spirits Knowledge Cards is a collection of 48 of her paintings of animal spirit beings. These are fantastical creatures, often part animal, part human. In her dream-like images we can feel the power and magic of these entities from nature. On the back of each card is a brief description of that animal's spiritual nature and its symbolic meaning in different cultures. 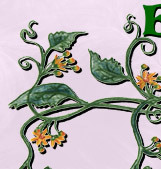 At the top, the animal's name is given with a few keywords for its symbology. Healing, Divinity and Invulnerability are listed for the Bear. This deck is designed for learning and meditation rather than divination. Susan Seddon Boulet is also the artist for the Goddesses Knowledge Cards.